It's already time for another update to the Google app, and this version bump carries a little bit of the post-CES glow with it. Of course, there are some new details related to the smart displays we've been expecting. Also joining the round of topics are clues that suggest we'll be able to use Google to identify TV shows by sound and that Google Assistant is going to become bilingual. There's even a sign of a new feature called summer time mode, though it's still a mystery for now. We haven't spotted any changes to the UI yet, but you can grab the latest version from the APK Mirror link at the bottom and let us know if you come across anything. Google dropped the veil on smart displays over the last week or so, beginning with a slightly underwhelming quasi-announcement video just before manufacturers like LG and JBL brought their Assistant-enabled displays to the CES floor. While the original examination of Quartz detailed most of the features we would have to look forward to, and CES demos filled in all of the blanks, there are still a few little bits and pieces to discuss. At this point, most of the information we've received has confirmed that Quartz is the codename for the software platform that drives smart displays that run Google Assistant. The codename Monet appears to be used for the UI itself. A new name recently joined the mix: Jasper. A few lines from the latest update basically confirm this is the codename for the new device type that is a Smart Display. Last week, we were tipped to a pair of new entries in some of Google's services listed in the Assistant directory – where you can look up all of the first and third-party services available to Assistant. One of these was missing a title and only used a generic phone icon, so there's not much to say about it, but the other was labeled "AndroidThings Jasper." Google has already stated that these smart displays run on Android Things, but we've also heard that Jasper is the name of a common hardware component (e.g. a reference board or chip) used in the upcoming smart displays. Both of the unexpected entries were removed several days ago, but the one for AndroidThings Jasper will obviously make a return as Smart Displays in the future. Since Google is preparing to feature services that work on smart displays, it seems highly likely that we're not far from seeing services built specifically for smart displays. In other words, developers should probably get ready to work on their own services when the tools become available to begin building. 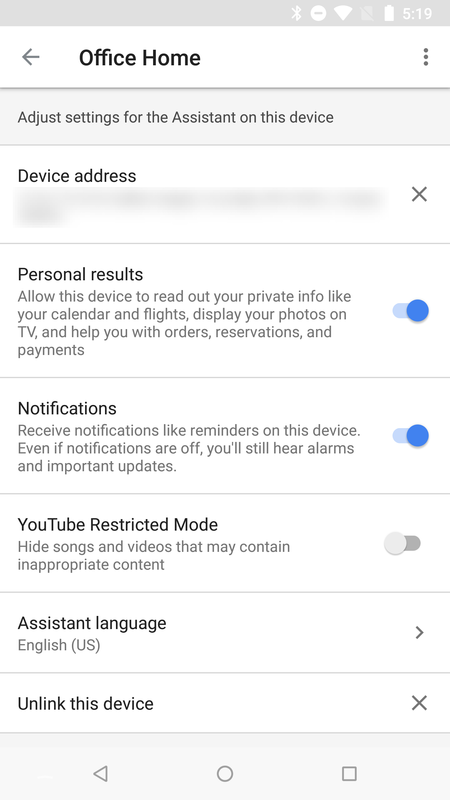 Among the other related additions in this update to the Google app is a settings screen dedicated to smart displays. 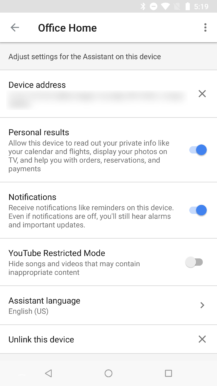 It currently contains a fairly standard set of lines, including: device name, location, a toggle for allowing access to personal account information, another for enabling notifications, and an option to set a default language. 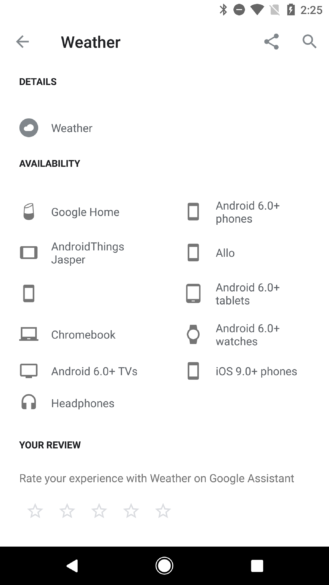 Basically, the same stuff you'll find for Google Home settings. There is also an additional point related to controlling a smart display, though highly predictable. You'll be able to instruct Assistant to "show my notifications" to get a list of cards from Google. This is basically the visual counterpart to the Pixel Buds (and other Assistant-enabled headphones) ability to read your notifications aloud. Google Assistant is growing to be more worldly as time goes by. It launched with just English and German (Deutsch) at the outset, but has grown a bit since then. However, as it stands now, you're still limited to a single language for all of the Google Home devices on your account. While that works for many people, it leaves a lot to be desired for multilingual homes. 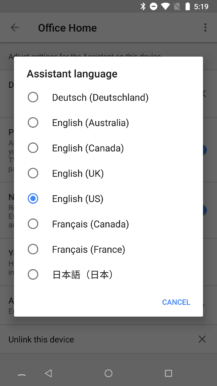 Google must be aware of this because Google Assistant appears to be going bilingual in the future. 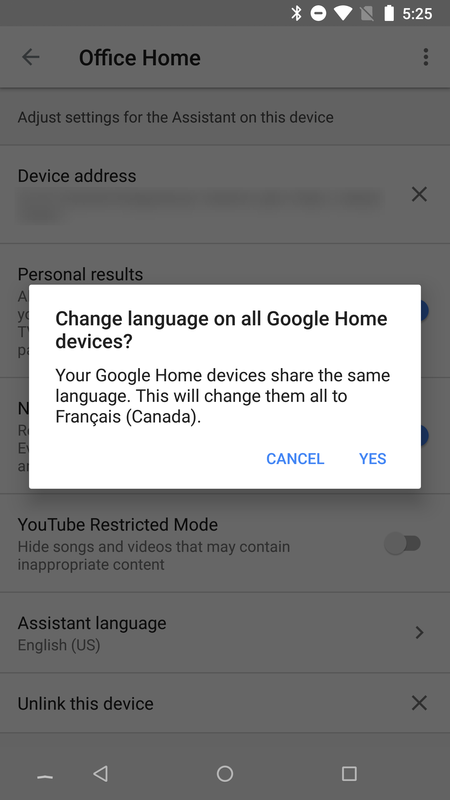 To be specific, you'll be able to choose a primary and secondary language for all of your Google Assistant devices. 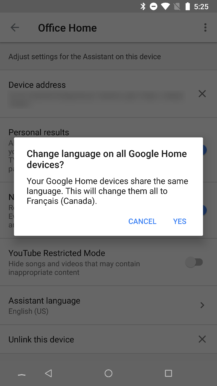 Upon making the change, all of your other Assistant-enabled devices will also switch to those same languages – that's all devices except your phones and tablets, which will continue to respect their individual device-specific language settings. This is basically identical to the current behavior, but with two languages instead of just the one. Note: These strings for secondary languages were removed in a later update. This is fairly common and they'll likely return again in another update. The structure for a new settings screen was also added in this version. The feature is called "summer time mode," though there's really no text to explain what exactly that will do. At this time, the only setting actually present in the XML is a single toggle to turn the mode on or off, so it's possible this is still more of a placeholder while the feature is in development. According to one label, summer time mode is currently limited to Google Home devices, which may mean it'll expand to other products in the future. It's pretty common to reach for your phone to identify a song as it plays in the background. Apps like Shazam and Soundhound were the kings of that scene for many years before Google jumped in with its own matching capabilities. Shazam later added another interesting angle with the ability to identify television shows by sound. A few other apps like VideoSurf and IntoNow attempted this, but they're not around anymore. 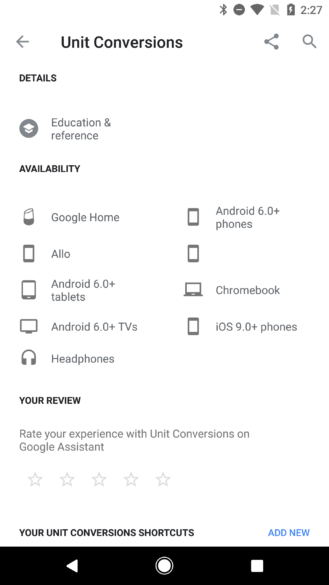 In fact, Google itself had done this with a Google Now card around 2014, but appears to have misplaced the feature, perhaps with the switch to Google Assistant. Regardless, it looks like Google may be taking a stab at TV identification again. The evidence is limited to a single line that closely resembles the "Listening for music..." status message, but for a feature like this, that's enough to jump to a safe conclusion. The thing I find interesting about this is that Google won't be able to apply the same beat detection know-how that's used to distinguish search phrases and commands from music, which means we'll have to issue a direct command like, "what show is this" if we want to start it listening in the correct context.